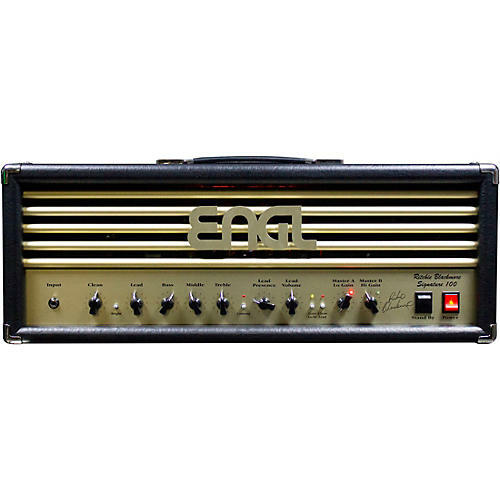 The Engl E650 V2 is an all-tube guitar amp head featuring the sound made famous by guitar legend Ritchie Blackmore. Based on the successful Savage technology, this Engl amp head delivers fine-tuned sounds from clean to crunch to high gain lead. You can vary the amount of crunch for the 2 channels Clean and Lead via the Gain Lo/Hi switch. More special features include two master volume controls, the contour button and a custom port for the connection of a compact footswitch that enables direct access to all important switching functions. With its high-quality components and superior finishing, the Ritchie Blackmore amp head is built to last. Enjoy a wide range of killer tones in an exceptionally easy to handle package. This V2 updated version of the E 650 Blackmore comes loaded with the following additional new features: SAC port for the Z9 MIDI foot controller, onboard switchable noise gate (incl. threshold control) and a switchable FX Loop.